Better than snorkeling in Bermuda! 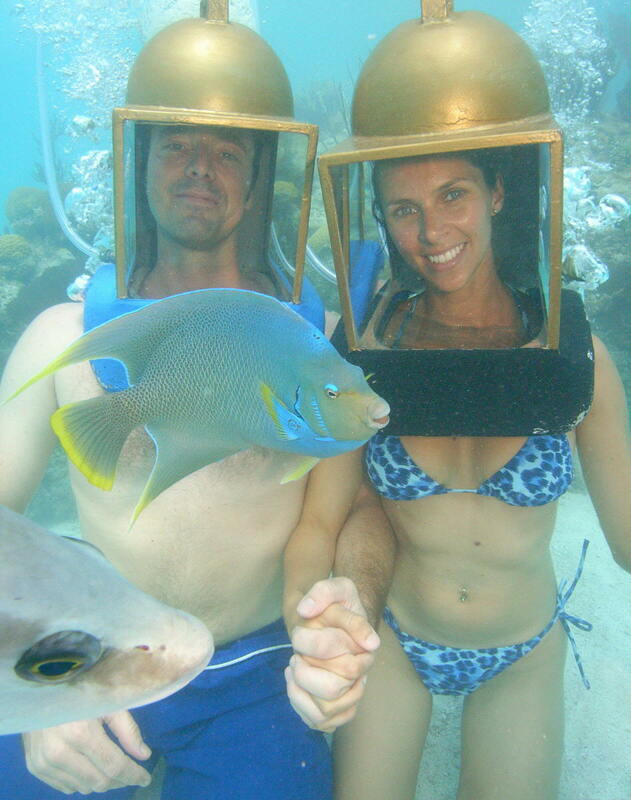 Snorkeling in Bermuda is great because it is relatively simple, easy to do, and does not require heavy equipment. The main disadvantage is not that you must know how to swim, but that you are stuck on the surface. Yes, you can hold your breath and swim underwater (that is called ‘free diving’), but your time down there is limited and the fish will generally move away from a swimming kicking diver. If you do stay on the surface, being placid and non-threatening, you must be careful not to get sunburned. While you are being mesmerized by the Bermudian sea life swimming about, your skin is being cooled by the water. However, the radiation is still burning you. With the Hartley diving helmet, your head is in the shade, you are upright, and have some protection from the six or so feet of water above you. If you are snorkeling in Bermuda, stuck at the surface, then water clarity becomes an issue. Even when it is windy and a bit murky it is not an issue for us because the fish come right up to us. Island Tour Centre offers Power snorkeling (being pulled along James Bond style). It has an allure and it is fun, but you will not see or interact with the marine live as with us. It is the same as driving along in your car on a road, cut through the forest, to glimpse at creatures, as opposed to observing forest creatures while hiking. This is not just a physical sensory experience, though sometimes we do moon jumping. We aim to satisfy you on all levels, physical, mental and higher. Either helmet or scuba diving in Bermuda has the advantage of being able to stay down, and even in one spot, so the fish do not perceive you as an advancing threat. Yes, this is a guided tour where you are not allowed to go off on your own, to have personal adventures. The flip side is that the fish are totally used to us, and are all around us expecting food, as opposed to swimming away because we are bigger than them. We look big enough to be able to swallow them whole, which is generally how fish meet their doom. As we have been diving at the same spot since 1984, the fish have grown up accepting us as a part of the normal environment. Come diving with us, have a great time. Find out what and how to touch. Then if you have the time, resources and unfulfilled desires, go off and have your own adventure, snorkeling in Bermuda.